The CAN modules are configured on the PC with the parameterization tool CANParam (included in the software package 800-600-1AA11). This means the communication parameters can be easily set. The parameters for a module can be stored in a project on the PC. The CAN modules support both the protocol format CAN 2.0A (11 bit) and CAN 2.0B (29 bit). Acceptance masks are available in the CAN modules. Using these masks, it is possible to activate or block various telegram IDs for reception. Express masks filter high-priority CAN telegrams to pass them directly to the PLC. For time-dependent events, such as the SYNC frame in CANopen, up to 16 timers with a resolution of up to 1 ms are available in the CAN modules. Each timer can transmit any CAN telegram. The timers can be started, stopped, and changed from the PLC. In addition, synchronized transmission of CAN messages can be enabled. With this, a time window in which all data will be transmitted synchronously is specified. Using freely programmable scripts, upon certain events, such as “Power ON” or “PLC Stop -> Run”, CAN frames can be sent or timers started. An integrated diagnostic function facilitates troubleshooting during commissioning of the module. 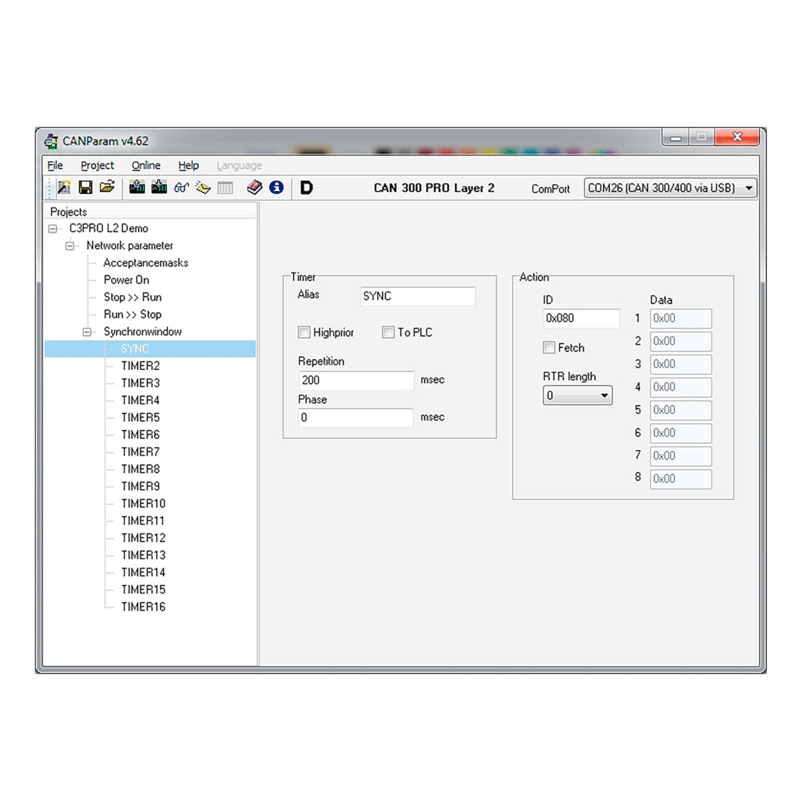 For the CANopen master function of the CAN 300 PRO, the behavior of the master can be defined and the slaves that exist in the CAN bus can be parameterized. 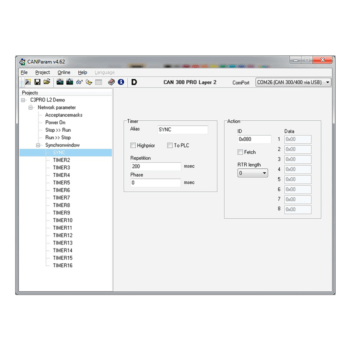 To simplify configuration, the CANParam software can read in the EDS files from CANopen slaves. The CAN modules are entered in the hardware configurator of the programming software as CP module (CAN 300, CAN 300 PRO) or as FM module (CAN 400) and addressed in the STEP* 7 program / ? ?TIA Portal* using handling blocks. For the CAN modules, handling blocks are available for Layer 2 communication and for the CANopen master (DS301 V4). For use of the CAN modules as CANopen slaves, handling for the profiles DS401 (I/O modules) and DS420 (Corrugator) is available. Additional profiles can be prepared on request. Application examples for control of drives according to profile DS402 are also available. Furthermore, handling blocks for the application of the CAN 300 PRO as a DeviceNet slave are available. With the handling blocks for Layer 2, any number of CAN protocols can be implemented in 11-bit and 29-bit mode. Scope of delivery CD with parameterization software “CANParam”, handling blocks “Layer 2”, “CANopen®” and “SAE J1939"